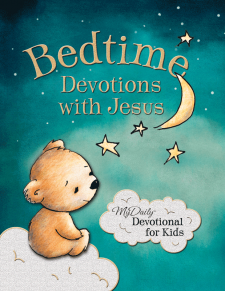 Bedtime Devotions with Jesus by Johnny Hunt is a lovely way to end yours and your child's day. I love that each night includes a scripture, teaching, prayer and a thought for the day. There are fifty-two weeks of devotionals making this a great one year devotional for young children. The book is meant for children 4-8 but I think it would be great for any young children as my 2 year old enjoyed it as well as my 5 and 7 year old. The scripture index at the back of the book is wonderful and the ribbon bookmark makes it easy to find your place the next night. My kids and I absolutely love the cute illustrations and including God in our nightly reading time. This is a great way to end the day. You can find Bedtime Devotions with Jesus by Johnny Hunt on Amazon, Barnes and Noble and other bookstores.